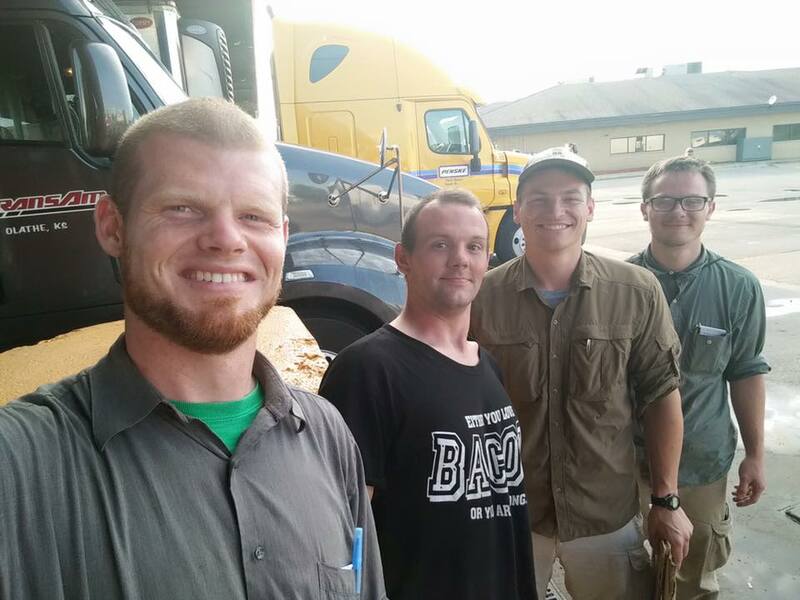 Rus Lyons, John Earhart and John Gruber caught a ride with Andrew (second from left) on the road to Memphis, TN. Story by Elizabeth Grams and Chris Meehan. Photo by Rus Lyons. The community’s missionary work extended to Tennessee this summer thanks to two short excursions led by Evansville missionary Rus Lyons. 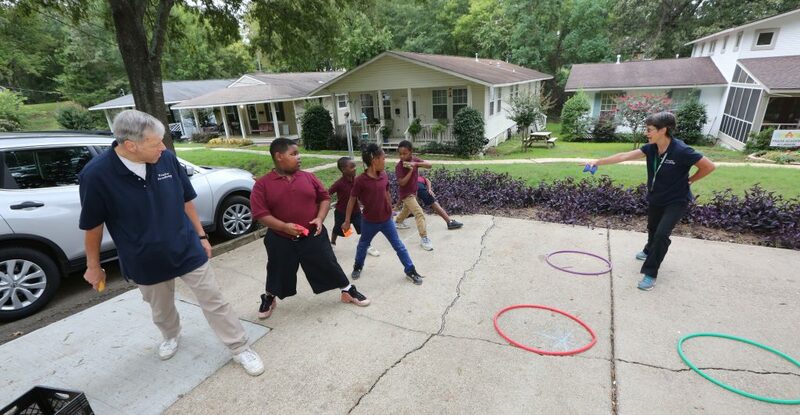 Rus traveled to Nashville July 6-10 and Memphis July 20-25, bringing two brothers in the community with him each time. The men visited poor neighborhoods in each city, knocking on doors and talking to people on the street. They shared words from the Lord and prayed with people for healing, conversion and the baptism in the Holy Spirit. Like Jesus’ first disciples, they traveled without definite plans for where they would find food and shelter. They hitched rides from truckers, begged for food and water, and stayed with local residents who agreed to house them on short notice. The men carried on their persons only a few Bibles, notepads, rain jackets, toiletries, IDs, a pocket knife and phones with chargers. Rus has made these kinds of “on faith” trips before—13 of them since 2008, but these two trips were the first since 2013. In Memphis, Rus, John Earhart and John Gruber (Servant Branch) preached to a crowd outside a two-story apartment building. “Jesus talks quite a bit about hell,” Rus called out to the people on the second-floor balcony, “because he doesn't want anyone to go there.” A group of men gathered around a truck in the apartment’s parking lot and interjected frequent questions and replies. One man knelt down on the gravel, made a public confession of his sins and recommitted his life to Christ. “There are a lot of people hungry for the Lord in Memphis,” observed John Earhart after the trip. In Nashville, George Kane, Ben Mysliwiec and Rus brought well-timed words of comfort from the Lord. One afternoon they told a man parking his truck that God wanted to fill him with joy. “Wow, I needed that,” he replied. Moments before, he had prayed, “I’m afraid to ask you, God, if it could get any worse.” He explained that he’d recently lost his house and job and his wife had divorced him. On another day, the missionaries brought a message of God’s love to a family grieving the loss of a relative. “I was just praying that God would send someone to pray with my family!,” a young man in the group told them. The missionaries prayed with the family on their porch, and later the man asked to be prayed with for the baptism in the Holy Spirit. Along the way, the missionaries found food, shelter and transportation from all kinds of people. They received rides from a trucker who picked them up on two different occasions and drove them a total of several hundred miles, from a pair of gospel singers, and from a Sikh who heard from them about Jesus’ resurrection for the first time. One family they met pooled all the money they had in the house–$29–for the three men. Managers at Popeye’s and Hardee’s restaurants provided free meals. A college student who knew a friend of the missionaries put them up for the night. Another family’s 14-year-old daughter used her birthday money to buy them food. A Christian couple, whom Jim Schenkel (Muncie) found through his nephew, hosted them a few nights. A young girl who heard they needed food and water ran to grab some cold water bottles from her refrigerator and thrust them into the missionaries’ hands. Rus plans to take at least one more group on a hitchhiking mission in the Mississippi River valley this year. “Please keep praying that the Holy Spirit guide us and revive our land!,” he says. Wow! Glory to God. Yes, Father! Revive our land! Thanks for the update! Your work not only brings life & light to those you meet along the way - but you also continue to bring light and life to our community, keeping us fresh and thinking about our life in Christ in new ways. We continue to pray for our missionaries. Glory be to God. I praise God for you brothers and your openess to the Spirit's leading. You inspire us all. May He always send His angels to accompany you!! Thank you, brothers, for being so attentive to the Lord and following his Holy Spirit wherever he leads! All these stories continue to inspire us to trust the Father more and be willing to step out in bringing the gospel to the hungry. My heart and prayers are with you all the way Bros.! WOW! GOD IS ANSWERING OUR PRAYERS BY CALLING YOU MEN OUT!, THANK YOU FOR ANSWERING HIS CALL! WE ARE HUMBLED. THANK YOU LORD! What a great way to start my day reading this post! It put things in perspective for me. You can count on my prayers and I rejoice that God is calling His people to Him! God is on the move, and the people are responding. Glory! Glory! It's so good to read again of your mission outreach - in two more cities ! Come Lord Jesus ! Thank you Father for protecting our bros. They are an inspiration to us at home.